Luxurious accommodations, turndown service, a dedicated resort professional to plan the perfect guys trip, unlimited golf per person per night of stay (including day of arrival/departure, same day replays, and cart), daily breakfast, welcome amenity on day of arrival with bucket of beer (3 per person) and chips and salsa, $50 golf retail credit, complimentary golf club storage, unlimited use of driving range and access to all resort amenities. - Unlimited use of driving range and access to all resort amenities. Please note: The resort is currently closed and scheduled to reopen May 2019. 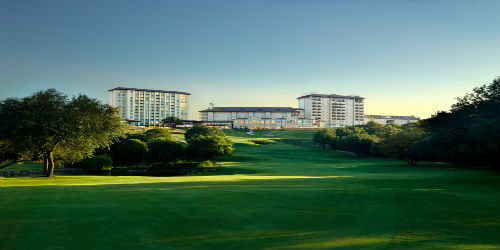 To schedule a tee time, contact us at (512) 329-4653. Subject to availability and blackout dates. Taxes and daily resort charge not included. Children not included. When calling 512-329-4665, please mention you saw this golf package on TexasGolf.com and mention promo code: TexasGolf.com. Omni Barton Creek Resort & Spa reserves the right to change price and offer at anytime. Prices and offer are subject to change without notice. TexasGolf.com is not responsible for errors posted in this golf package.